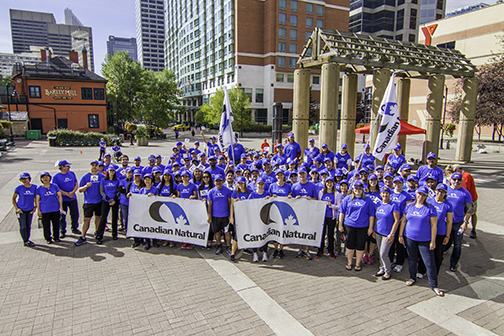 Canadian Natural donated $2 million toward the RESOLVE Campaign to find long-term solutions to homelessness. The RESOLVE Campaign is a partnership of nine Calgary social service agencies that came together with a single, one-time goal — to raise the capital needed to create affordable rental housing with support services on a sustainable basis for up to 3,000 homeless and vulnerable Calgarians who need it the most. RESOLVE was designed to help people with a high level of need for various reasons, including: chronic homelessness; mental and/or physical health challenges; mobility issues; addiction; transitioning back into the community from the justice system; as well as, women, families, seniors and youth. To date, the Campaign has raised enough to provide 1,850 Calgarians with a stable home and resources needed to find a fresh start, and continues to strive for the goal of making a home a reality for many more vulnerable and homeless people. In 2017, construction of a 160-unit facility started on land purchased from Silvera for Seniors facing Glenmore Trail at 45th Street SW. This facility will include a five-storey building for Horizon Housing Society. Silvera for Seniors is one of the RESOLVE Partners, working to address the challenges of a growing senior population that will also need affordable and supportive housing options. RESOLVE Partners include: Accessible Housing, Bishop O’Byrne Housing Association, Calgary Alpha House Society, Calgary Homeless Foundation, Calgary John Howard Society, Horizon Housing Society, Silvera for Seniors, The Mustard Seed and Trinity Place Foundation of Alberta. The provincial government, private and corporate donors have supported the Campaign.